ESRO 2 (European Space Research Organisation), Iris (International Radiation Investigation Satellite) was a 75 kg spin-stabilized spacecraft On the launch of ESRO 2A, the third stage vehicle failed and the spacecraft did not achieve orbit. ESRO 2B was launched on 16 May 1968, into a near polar orbit. The main objective of ESRO 2 was to conduct a study of solar astronomy and cosmic rays. The ESRO 2 experiments had their counterparts in the NASA-OSO series. 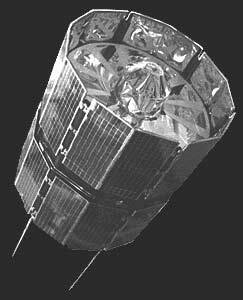 The purpose of the spacecraft was to provide continuity to the solar radiation observations carried out by OSO D launched 18 October 1967. The particle experiments were designed to continue similar measurements carried out by the Ariel 1 (UK 1) satellite. The satellite had a spin rate of about 40 rpm and had completed 16,282 orbits of the earth before reentry on 8 May 1971, shortly after 0300 UT. No playback data has been available since 10 December 1968, following a mechanical failure of the onboard tape recorder. The failure reduced the data flow by about 80 percent, although a combination of Estrack (ESRO) and STADAN (NASA) tracking stations were used.